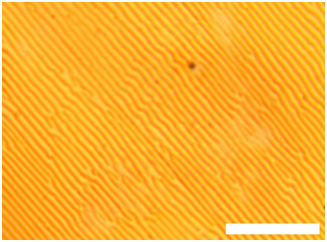 Combining the anisotropic optical properties of liquid crystals (LCs) with the mechanical properties of polymers has a large potential for possible applications. Flexible displays, optical polarizing or compensating filters, switchable holograms and optical storage are just a few examples of emerging technologies. Currently, we are working on polymer-stabilized blue phases, which are promising materials for a new generation of liquid crystal displays (LCDs). They exhibit fast switching, high contrast and easy fabrication. The benefits of the underlying optical Kerr effect have been known for a long time, but only the combination with a polymer network enabled enhancing the temperature range of the appearance of LC blue phases to values that are technically needed. Dispersion of nanoparticles in ordered fluids can also alter and hopefully enhance the electro-optic performance of LCs, considerably. 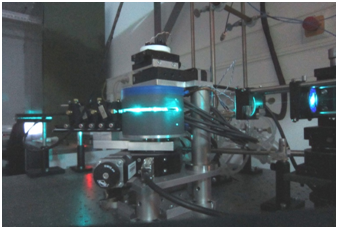 Our studies include the dispersion of metal-, luminescent semiconductor-, dielectric and ferroelectric particles in LCs. Confocal microscopy, X-ray diffraction and electro-optic studies indicate that nanoparticles can alter the alignment, the order parameter and the electro-optic switching behaviour. The switching from a bright ground state to a field- induced dark state can even be inverted (dark ground state, field-induced bright state) by adding nanoparticles to a LC.